My six year old did have a point. Our sandpit had been neglected for a while and even though I’d pulled all the weeds out and dug over the sand, it still wasn’t very enticing. Even my nine year old was interested when he heard me say that the river would actually hold water. “It won’t hold water. The water just sinks into the sand!” he said accusingly, but I had a secret plan! I set the boys to work digging a narrow trench across the length of the sandpit, and filling some buckets with water while I collected the things we’d need to make a river in the sandpit. A few plastic bottle caps for boats. 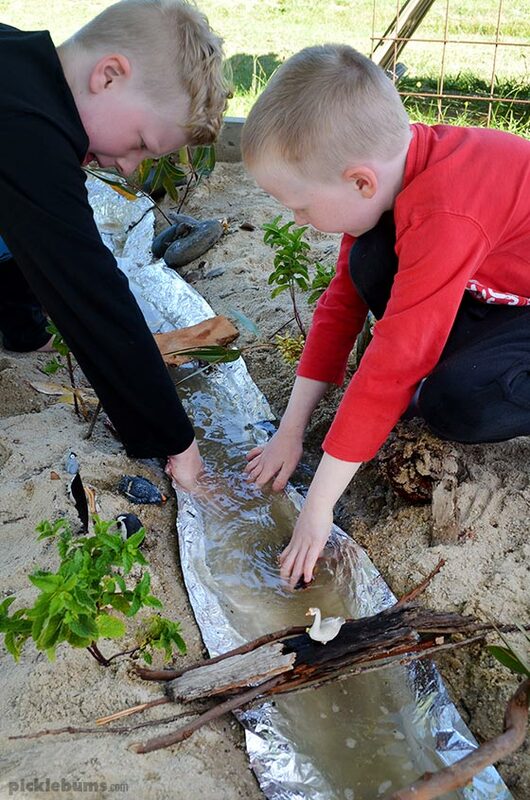 To make the river actually hold water, we lined the narrow trench the boys had dug with some foil. 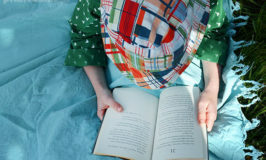 You need to be careful when pushing the foil into the sand so you don’t make holes or tear it, but if that does happen, just add an extra layer of foil over the top. Now just pour some water into one end of the river and watch it flow! The boys had a great time building bridges out of sticks and bark, and lining the banks of the river with ‘trees’. Noah built a den for the platypus to live in and Morgan build a dam with a waterfall that flowed into the river! And both of them had fun racing bottle cap boats down the river as they poured water in at one end. This easy imaginative play set up kept the boys busy in the ‘boring’ sand pit for a long time! 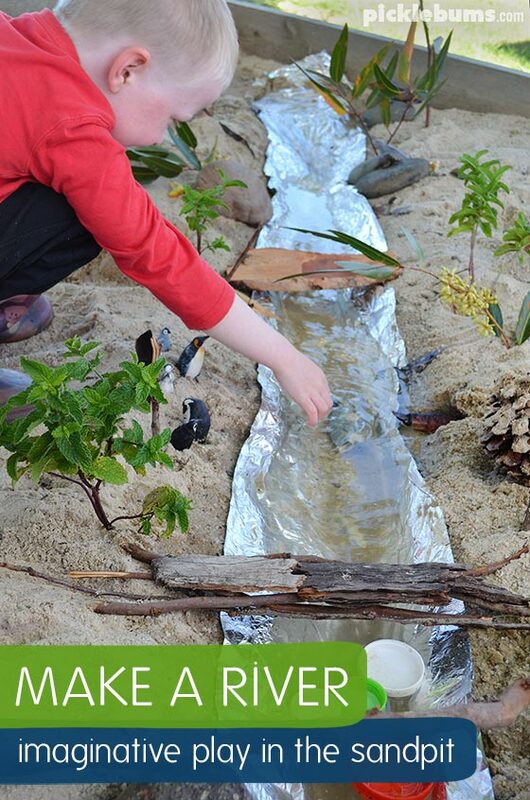 So next time your sand pit is ‘boring’ why not make a river! 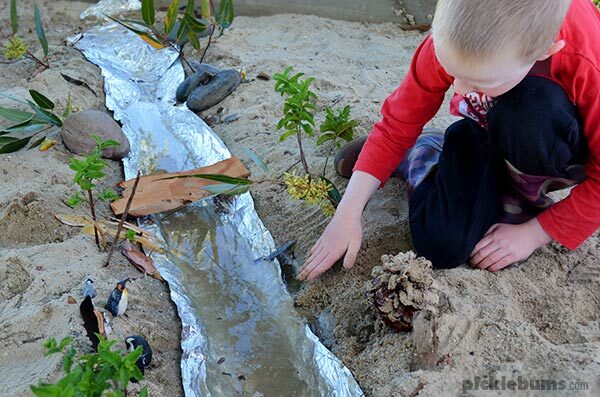 If you don’t have a sandpit you can make a river in a small tub of sand or soil. 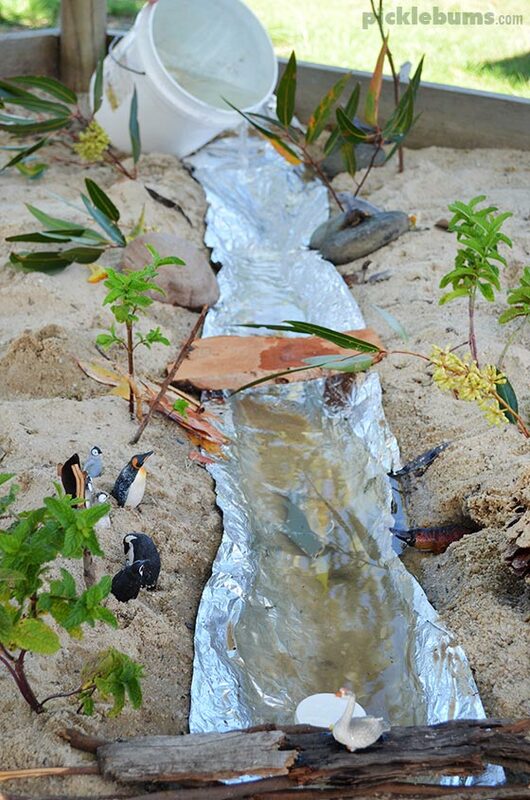 We used the same technique to add a river to our dinosaur garden – find out more here. Oh my gosh, my youngest absolutely loves running water, like OBSESSED. She would love this type of activity and so would her oldest sister. 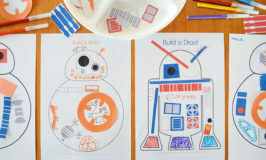 So simple and lots of fun. Thanks for sharing Kate. Adding water to the sandpit always make it more fun … the kids at day care love cooking in the sandpit, as long as there is water. Even the school age kids got in on making a dinosaur home one day. Home » Make A River!